October 4, 2016. Autumn has been surprisingly warm and sunny so far this year. (Thank you global warming!) The birches are just beginning to flaunt their golden crowns, so Matthew and I decided to make a Sunday trek to see them in their natural habitat. We’d gotten into a bit of a rut, always heading to the Nordmarka for our little hikes. But this time, we decided to try something new — the Østmarka. 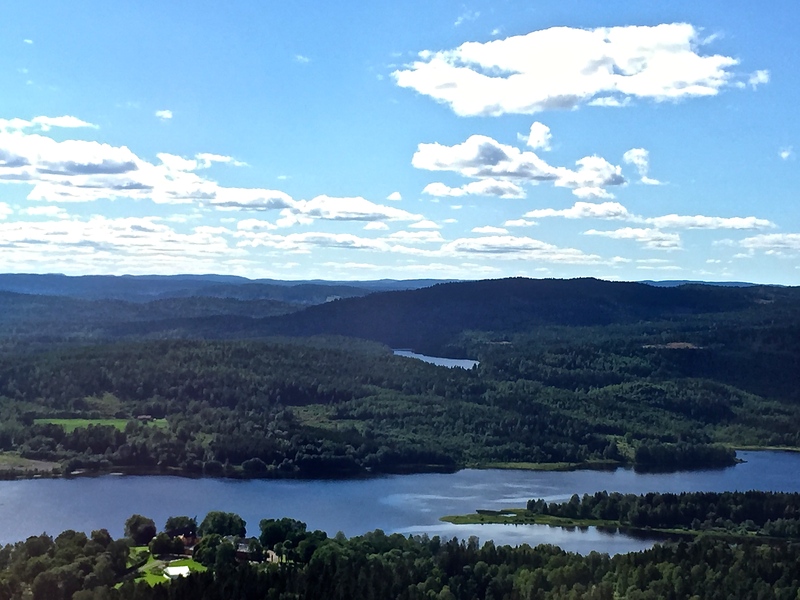 A 20-minute train ride will take you outside Oslo’s bustling urban center and into its pristine “markas” — vast swaths of wilderness where you can hike, bike, ski, camp, and swim. Let me start with a brief explanation of the term marka, which not-so-surprisingly translates as “mark,” meaning “boundary lands.” It’s one of those old-English words (with Viking roots) that has fallen out of fashion in the modern world — unless you’re a Medieval historian, a frequenter of Renaissance Faires, or a fan of Tolkien. Basically, it’s an all-encompassing term for any vast expanse of public woodlands situated right outside the city. It “marks” where you leave civilization and head into wilderness. Sounds like a pretty sweet deal, right? So how do you find these last bastions of personal freedom? By taking any of Oslo’s metro train lines to their various endpoints. 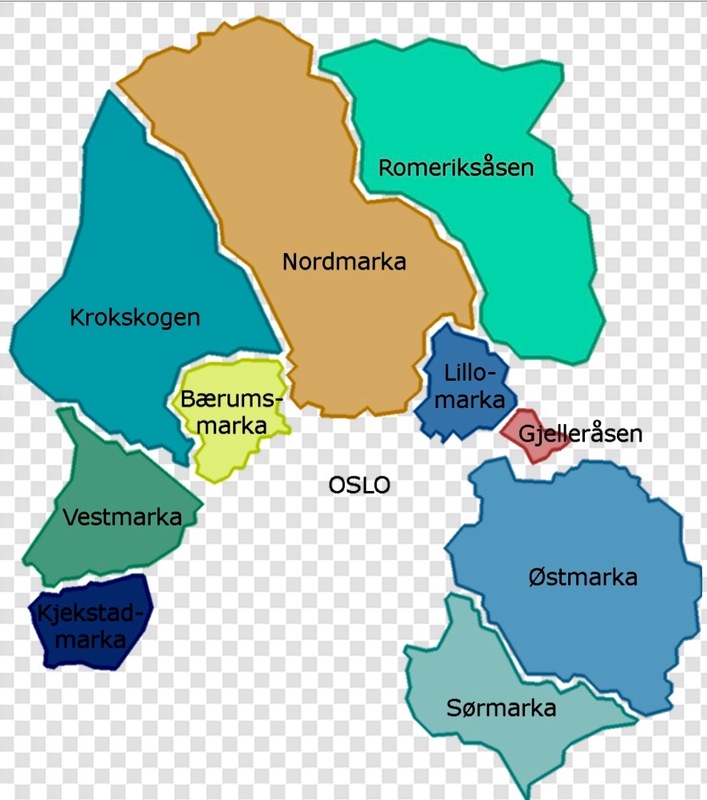 Most of the markas are prefaced by general place names, such as Baerum and Kjekstad, or by the cardinal directions: Nord (“North”), Sør (“South), Øst (“East”) and Vest (“West”). 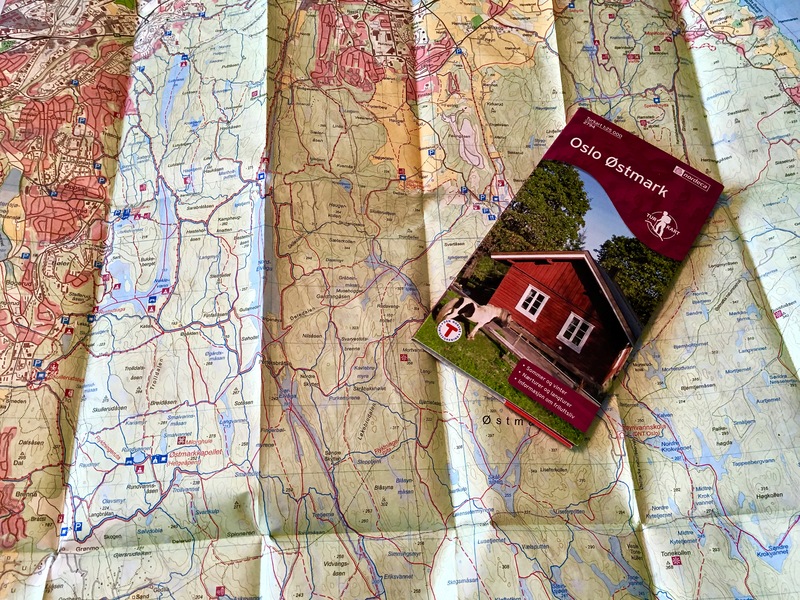 Unfortunately, these names don’t appear on most regular tourist maps, so if you’re interested in exploring the markas, I’d recommend dropping by the downtown Oslo branch of the Norwegian Trekking Association (commonly known as DNT) and picking up a detailed hiking map. Too bad we didn’t heed our own advice, which is what got us into trouble when trying to orienteer our way to and through the Østmarka. But more about that momentarily…. 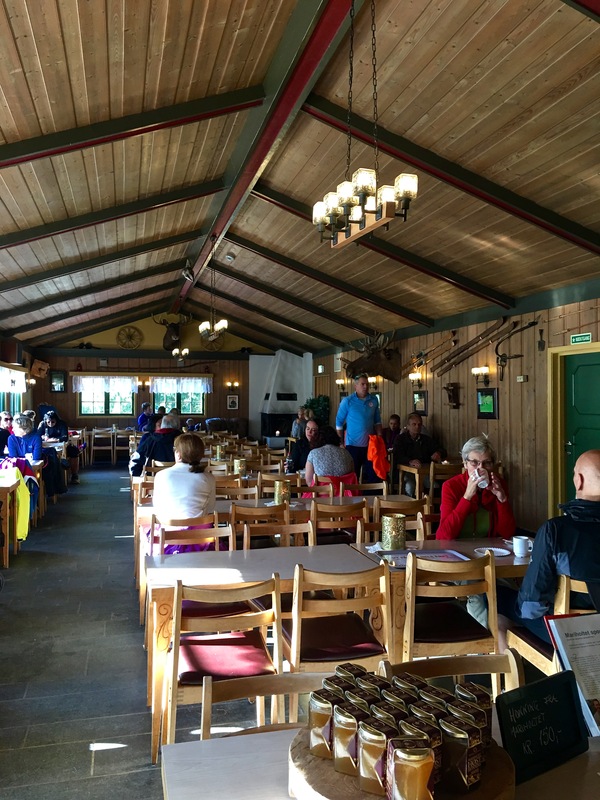 The Mariholtet Sportsstue is one of many “sports cabins” where trekkers, cyclists, and skiers can refuel during their excursions. I like how Norwegians think: all roads lead to food. We’d opted for a fairly short Sunday afternoon jaunt into the Østmarka, since work had been claiming a lot of our weekend mornings. As usual, we’d selected an eatery — the Mariholtet Sportsstue — as our trek’s end goal. (We’re completely smitten by the idea that no matter how remote a hike may feel, there’s always one of these cute little log-cabin-ish cafés tucked in amongst the trees somewhere.) According to the online map we’d printed out, Mariholtet should have been a straight shot from the Ellingsrudåsen train stop. The Norwegian Trekking Association offers great maps that show complete trail details for both skiing and hiking. And notice that this map of Østmarka gives you a clear picture of how the city suddenly stops at the boundary of the forest. We ambled around the neighborhood for awhile, looking for a pathway, but no such luck. So Matthew came up with a new game plan: “Let’s wait until another trainload of people arrives, then we’ll follow anyone who looks as if he’s dressed for hiking.” The next train disgorged a passel of North Face-clad folks, whom we covertly tailed for a stretch until we hit a country lane where everyone split up and went in different directions — mostly towards their own houses. So much for Plan B. Behold — the huge stones that lay beneath the pile of dead leaves covering the path next to people’s homes. Compared to gunshots, these hidden tripping hazards proved to be a much more subtle way to deter casual hikers. 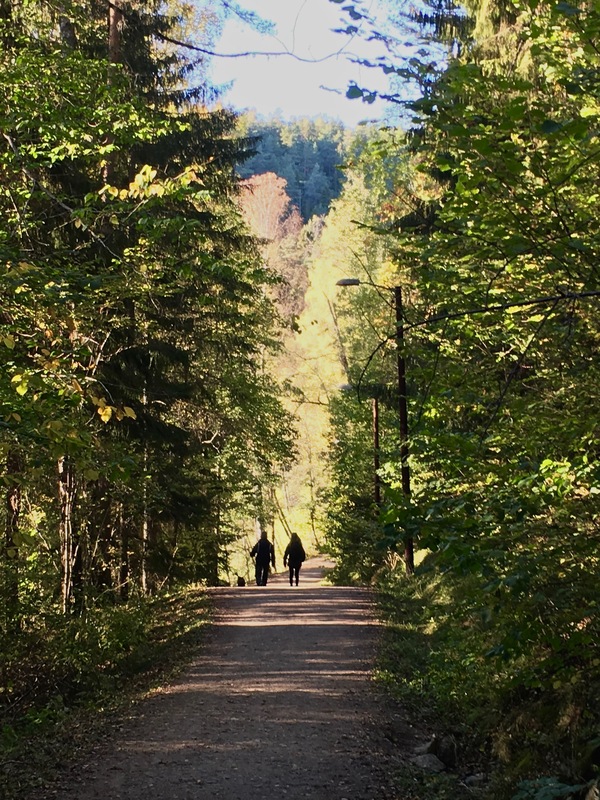 Check out the dazzling fall colors along our chosen Østmarka path. Thankfully, no one appeared on their back porch to hurry us on our way with an overhead rifle blast. And as we trekked, we left the houses behind and the stillness of the forest crept up on us. Sunlight filtering through the trees worked its magic on our shoulders and melted away the tensions of way-finding. Yellow leaves lay piled like gold coins around the trunks of birches, turning them into the proverbial “money trees.” The acrid smell of decaying leaves and the incense-like scent of birch fires from nearby chimneys reminded us that the pleasures of autumn are brief in these parts. Sooner than expected, we came upon a gorgeous wooden structure that we assumed was our destination. But it seemed far larger than we’d anticipated, with lots of outbuildings scattered around the property. And where were all the hikers, bikers, and dog-walkers that usually camp out on the lawn at these cafés? The place seemed deserted. And in fact, it was … because it was closed. Many of you know by now that Matthew has a long-standing joke about his uncanny ability to shut down restaurants. He can’t tell you how many times he’s confirmed a reservation mere hours before eating, only to show up and discover that the place has just had a kitchen fire, or the health department has suddenly shut it down, or a family emergency has unexpectedly befallen the owner. Poor Matthew seems to be a harbinger of doom for dining spots. But in this case, as we peered in the darkened windows of the place and spotted the welcome sign, we realized it wasn’t Mariholtet, but Østmarkseteren — an old farmstead that has been converted into a restaurant open only for special events. Yet again, we’d somehow wandered off our seemingly straightforward path. Luckily, a passing dog-walker pointed us in the right direction towards Mariholtet, and we headed off through the trees. Families gathered on a tiny beach advertised as an official “badeplass” (bathing place), but no one seemed brave enough to go for a swim. An old corkscrew road and bridge once linked Oslo to Sarabråten, a recreational area of the Østmarka developed in the 1850s by Thomas J. Heftye. He brought lots of famous folks here, including Henrik Ibsen and King Oskar I of Sweden and Norway. Heftye grew tired of traveling around the entire north end of Lake Nøklevann, so he put in the earthen dyke / roadway that you can see in the distance as a shortcut to Sarabråten. Today, part of the lake has infilled to become a lush, marshy wetlands. Lovely little mallards looking for a meal cruise along the rocky edges of the dyke. To house his guests and encourage others to enjoy the outdoors, Heftye built a grand summer home and other outbuildings that overlooked the Nøklevann. Today, only the foundations remain. In 1868, Heyfte became the co-founder and first chairman of the Norwegian Tourist Association (DNT — Den Norske Turistforening). All of Heftye’s buildings (except a coach house used as a cafe until it burned down), were razed when the Nøklevann (meaning “key waters”) was converted into a source of drinking water for Oslo. Some of the wood from these buildings were used to build Østmarkseteren, the special events restaurant Matthew and I had walked past earlier. 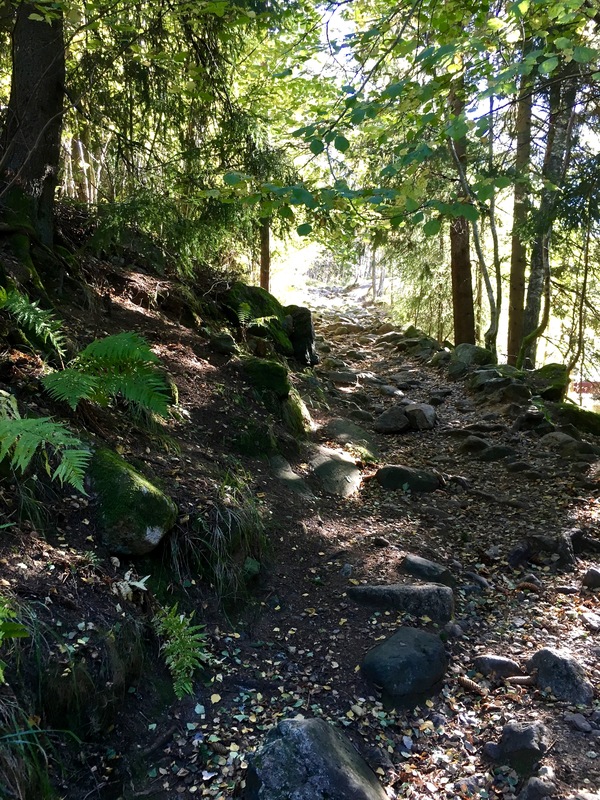 A section of the steep slope down to the Nøklevann was made into a ski jump in 1898. Crown Prince Olav himself competed in one of the ski races here. Along the trails at Sarabråten, informative labels help identify tree species. The birches on the left sport the smooth, horizontally striped bark of the Dunbjørk (Betula pubescens). In English we call it a White Birch or Moor Birch. The blotchy trunks on the right belong to the Hengebjørk (Betula verrucosa), or Hanging Birch, so called because the new growth at the end of its branches droops downward. Gorgeous moss covers the rocks here — I can’t even begin to count all the varieties. 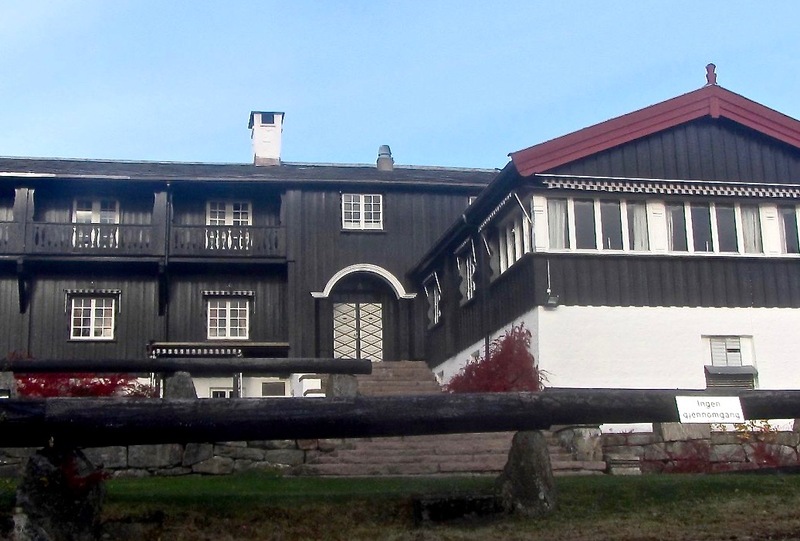 During World War II, the Norwegian resistance group known as Milorg used Sarabråten as their training grounds and a base for smuggling refugees into Sweden. In February of 1945, two members of Milorg were killed in action, and seven more were arrested and later executed at Akershus Fortress. Every year, the Friends of Østmarka host a memorial ceremony here for the fallen Milorg members. 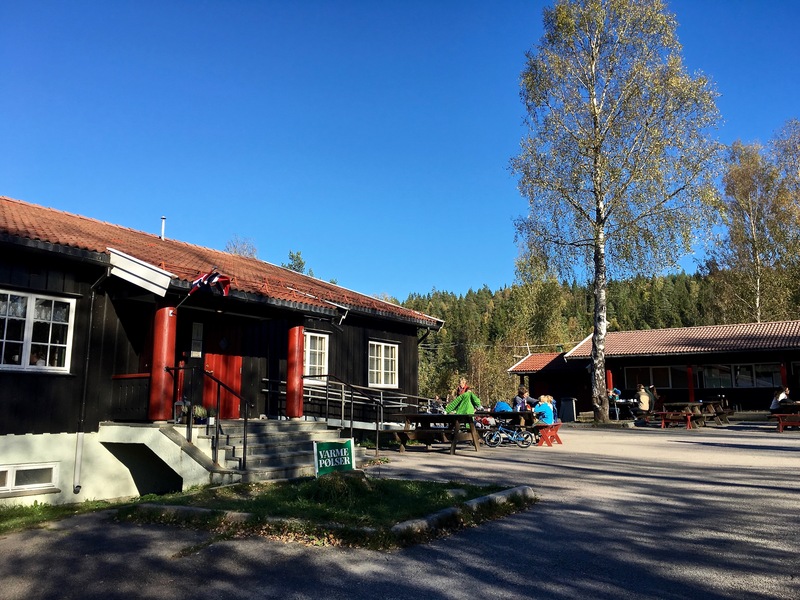 A short distance later, we found ourselves at Mariholtet Sportsstue, where we took time for a beer, a bowl of stew, a delicious sticky bun, and a bit of birdwatching before hitting the trail homeward. It turns out that the café is situated along the edges of North Elvåga, a spot mentioned in Norse mythology as the home of a giant named Hymer. The legendary lake has now been split into two sections: one serves as a reservoir and the other is a recreational waterway. Skirting the fun-n-games portion of the shoreline, we discovered the longest diving platform I’ve ever seen. I tottered out onto it and was rewarded with the roller-coaster sensation of my stomach dropping, suspended as I was over all of that deep blue. Matthew, of course, considered attempting a swan dive. But since the sun was setting, we opted for high-tailing it back towards the train station. Pictured is a Great Spotted Woodpecker (Dendrocopos major) hammering at the tree that supports several bird feeders at Mariholtet. The bird seems able somehow to measure the speed of sound and identify trees of the perfect density for boring into and making a nest. A dam cinches the 7-km (4.3 mi)-long North Elvåga Lake into two sections. 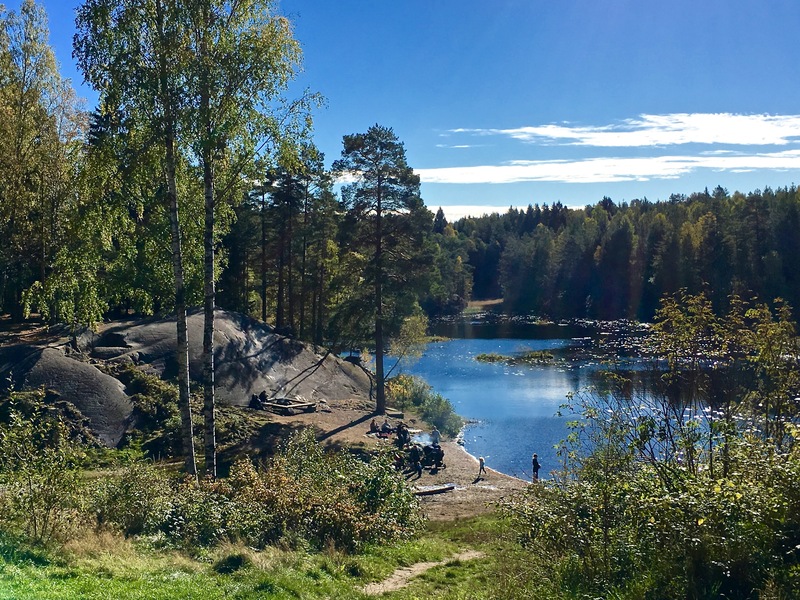 The smaller section is used for fishing, boating, and swimming, while the larger section feeds into South Elvåga Lake, both of which are reserved for drinking water. While all that deep blue water had a rather dizzying, hypnotic effect on me, its chilly temperature prevented me from being tempted to test the diving board. 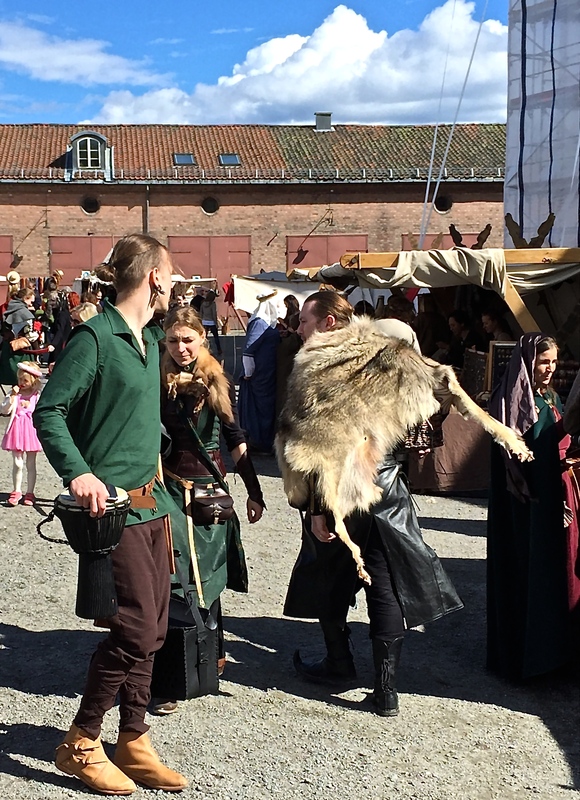 Elvåga is an Old Norse name associated with the Viking religion. The lake is fed by the Elvåga River, which is mentioned in ancient Viking Edda texts as “an icy border river dividing the world of the giants from the world of humans.” In another ancient text, the Heimskringla, folks are warned, “Do not venture to the Elvåga, for there live the creepy creatures sung of by the bard.” Interestingly, the Elvåga River is the only river in Norway that flows northward. Drinking from it is said to cure any ailment. Hmm, seems like kind of a push / pull situation, doesn’t it? 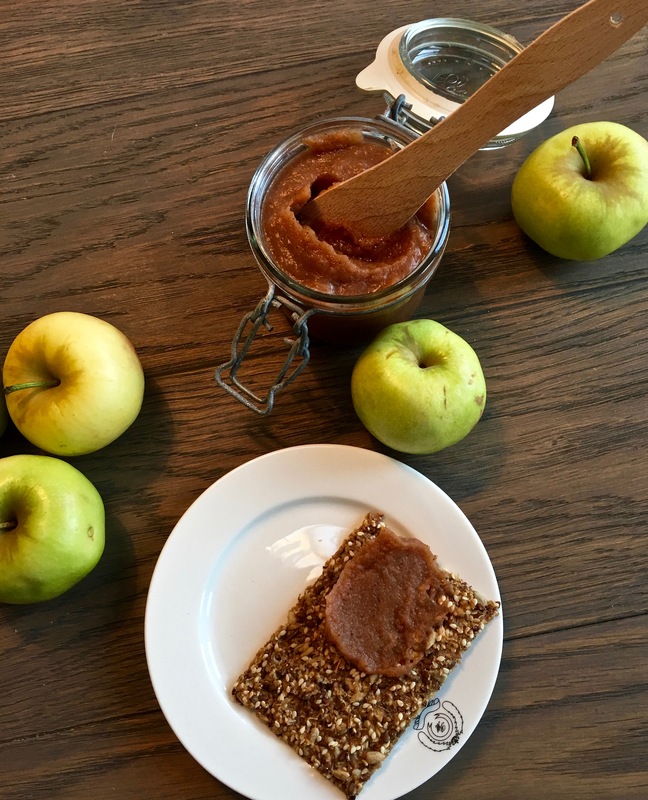 My granny’s recipe for apple butter has gone native, being made of Norwegian apples, and here it’s spread on Knekkebrød (literally translated as “Break Bread” — think cracker made mostly of seeds). Anyway, some day I have to go back and thank that man for sharing his harvest and directional advice with us…. So I did a little research on Norwegian apples, and it turns out that there aren’t any native species. These are Granny Smith’s — but tiny, knobby, and rather worm-eaten because Norwegians don’t drown everything in chemical fertilizer and pesticides like we do back in the States. It’s about the flavor, not the size, and these Granny Smith’s turned out to be much sweeter than the ones back home. I gave a batch of my apple butter to my Norwegian friend Sophie, and she texted me a photo of how she’s using it to flavor her morning porridge, enhanced with some walnuts. My granny would be so thrilled that her recipe is being appreciated internationally.